My favorite soup this year… We had some friends from Nathan’s school over for dinner about a month ago. I decided to make the entire meal from scratch. That’s right. No shortcuts, nothing from a box. The menu consisted of this soup with rolls, green beans, broccoli rice, curried shrimp kabobs and apple crisp with vanilla ice cream. Cut zucchini, carrot and onion into 1″ pieces. Place in a large pot with chicken stock. Cover pot and bring to a boil. Once boiled, allow to simmer for about 7 minutes. 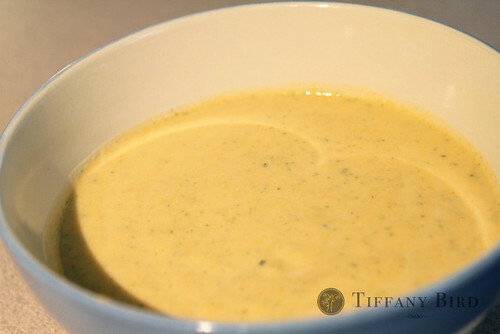 Put half the vegetables mixture (with some of the stock) in a blender with 1/2 the cream cheese. Puree until creamy and well blended. Put in a bowl, then do the same to the other 1/2 of the mixture. I think I’m going to have to try this soup. You just can’t go wrong with cream cheese-YUM! This sounds delicious!. I just found your blog through the Sew Mama Sew list of tutes, and I think I was in a BYU ward with your husband or something. You are really creative and I love your blog! Yum, looks so creamy and delicious! I will definitely have to try this! Mmmm… Sounds yummy! I will definitely have to try this. I’m not a big cream cheese fan… would you suggest anything else? Possibly yogurt? cream? or half&half? i haven’t tried anything else. but perhaps plain yogurt would work. This looks simply delicious! Can’t wait to try it.